How to customize the header of SfCalendar? You can customize the header of SfCalendar by using the HeaderTemplate property. This article explains how to customize the header of SfCalendar and to display the month. 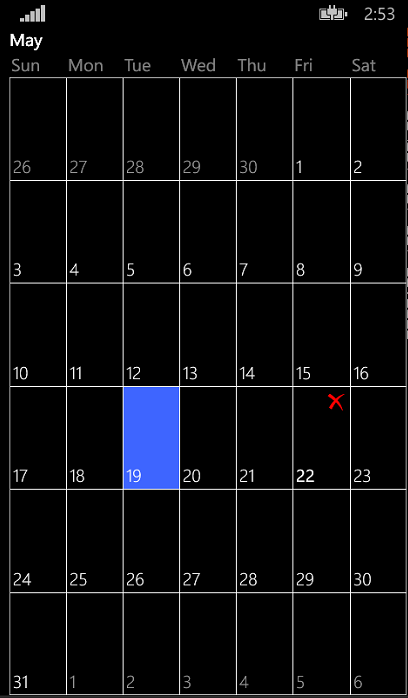 Create a WindowsPhone application and add SfCalendar to it. Set the HeaderTemplate to SfCalendar. Bind the DisplayDate of SfCalendar to the Text property of the TextBlock. In the following code example, StringFormat is set as “MMMM” to change the header. The following screenshot displays the output of the above code.